Ok, at 100,000 feet it’s not really “space” but for $320 USD JP Aerospace is offering a very affordable way to get your research experiment, brand statement, artwork or anything you can imagine (and that fits into a 50mm cube, weight limits apply) into the upper atmosphere. Pretty cool! Touting its program as “stomping down the cost of space”, Rancho Cordova, California-based JP Aerospace (America’s OTHER Space Program) is offering its MiniCube platform to anyone who wants to get… well, something… carried up to 100,000 feet. The plastic MiniCubes are each 1mm-thick, 48mm wide and 50mm high. Their bases have a standard tripod mount, and the MiniCubes can be cut, drilled, printed and/or modified within parameters before being mailed back to JPA for flight. 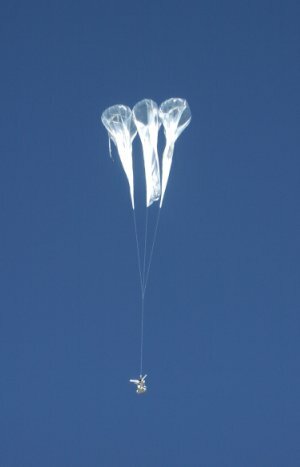 Once the MiniCubes are flown, they are returned to their customers along with a data sheet and a CD of images from the mission. All for $320! Again, it may not technically be “space”, but the view’s not bad. At the time of this writing there are 20 spaces available for the next JPA high-altitude balloon flight on September 22. Find out more about JPA, MiniCubes, size specifications and how to purchase a space on the next flight here. Um, with accessibility space is becoming more mundane. 5 by 5 cm. OMG. What can you put in there ? I get your point, but seriously, it’s a cube. We’ve had 6440 experiments put into ping pong balls over the last seven years. Most are simple, but about 1 on 8 have a computer and three or four sensor. We’ve have a few dozen with dual data loggers, over twenty sensors and telemetry systems. When the students that fly these (the experiments are called PongSats) see the MiniCubes they often say “Wow, what do I do with all that space!” Most of the folks doing the really complex PongSats are Junior High and High School students. University professors and full engineers tend to fly marshmallows and plant seeds. The MiniCube is four times the volume of a PongSat. I’m building a MiniCube myself that has a magnetohydrodynamic generator in it driven by a 1/2 A model rocket motor, two basic stamp computers and a 4gig data logger. It will fly on the September flight. 5 cm cube really is a lot of space.